Butterflies mounted on a board behind glass and framed. Mineral specimens, fossils, eggs and even a sea horse in this tabletop display. I love this tabletop museum cabinet on the floor, filled with shells and the like. A talking piece, that is for sure. 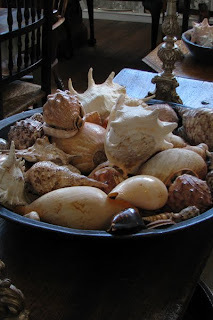 In our store we have a large wooden bowl filled with a collection of shells. People are drawn to them, including children who put them to their ears to listen to the sea. We also have this collection of polished nautilus shells. My favourite shell! And here is my special collection of shells and stones, which I sometimes keep in a large French glass jar. At the moment they are in a crystal bowl I bought on my first trip to France. That tabletop museum cabinet is such a wonderful idea! What a wonderful 'coffee table'.